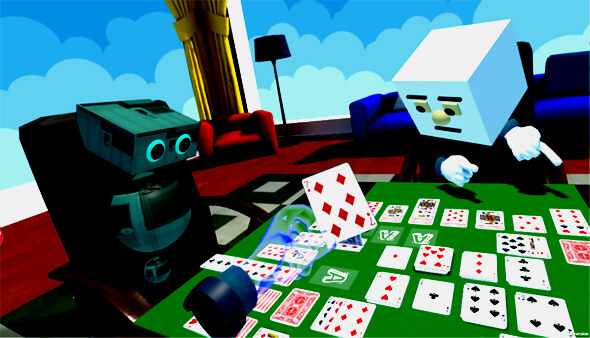 How can Virtual Reality games be more social? Virtual Reality is no doubt one of the technologies that we have today with the highest potential for growth. It is also one of the emerging platforms for gaming and social media. However, much work still has to be done in order for VR to be able to deliver the level of socializing we see in today’s current MMO games. One of the problems associated with Virtual Reality is that it isolates the user from ones immediate surroundings. Also, most early games and applications where single user activities so contact with other real people was almost totally non-existent. Eventually, multi-player games and platforms for VR have been released and VR users worldwide have started to make use of the potential that socializing brings to VR. Despite these developments however, a lot of work still has to be done in making VR gaming platforms have and attain the kind of social characteristics and environment that most massive multi-player online games have today. Be whatever genre it may be, MMO games have reached a point where social contact with other players be it only online or even personal face to face meet-ups have become the norm of the day. The social factor in today’s games have made MMO games more popular than completely single player releases where interaction only with programmed NPC characters is possible. Multi-player brings out the human factor in gaming and things like team play and camaraderie play a very important role in the success of the game. These are very much evident in competitive oriented games like those used in eSports. A milder side to socializing in games would be those games where a certain number of players have to help each other in constructing things or achieving objectives in the game. Games like Keep Talking And Nobody Explodes where a couple of players have to team up to defuse a bomb and friendly team based games like Pictionary and other word games are by far the most effective in making computer games a more sociable affair. With the potential of VR to provide a much more personal social experience as compared to the current non-VR platforms, more and more of these socially oriented titles are being ported to the VR world. Keep Talking And Nobody Explodes is one of these and the port has been quite successful. Still, a lot of work has to be done as VR today is yet to achieve the kind of mass distribution and everyday use to be considered as a current popular kind of social medium. The main problems that continues to hinder the process of making socially oriented VR games truly social are more hardware oriented than the content being released. Developers are continually releasing new content for the VR market but there is not enough users available to make use of these content. There is not enough distribution of VR HMDs to create the massive demand necessary to bring the needed socializing into VR gaming. The high cost of VR equipment is already a big deterrent to making VR a mass product for public consumption. Even at the mobile level, what can be considered as effective VR is limited to the high-end expensive smart phones. Another factor would be the current state of VR technology today. VR equipment are still in the process of development as well and thus plagued with low visual quality, uncomfortable side effects coupled with the mobility and flexibility limitations in usage. All these contribute in hindering the mass use of VR and without that, the massive platform of users to make socializing in VR an everyday experience. The VR industry will have to surmount these problems first in order for the technology to achieve it’s potential in being the foremost social medium in both gaming and other fields as well. For those who have seen the movie "Ready Player One", the usage of VR as the main form of social media is depicted beautifully in the novel and movie's storyline. The way Wade uses his VR headset in the future is not such a far fetched idea today as it can really be achievable when the time come. It will be up to the VR industry today to make that future happen when we can have ultimate virtual reality gaming platforms like the OASIS where we can all play and socialize in.